﻿ great halloween book to read with your kids! great halloween book to read with your kids! My oldest has developed a fondness for “scaries.” If we are out shopping, he insists on visiting the Halloween aisles to look at all the “scaries.” And I do mean all of them. Halloween costumes and decorations and supplies thrill him to the core. Since books are also important to him, and I’m not a complete Halloween Scrooge, I wanted to procure a small collection appropriate for the season. Turns out, good Halloween books are hard to come by. We’ve found a few happy favorites, though. With this one at the top of the list. As children’s literature goes, it’s not what I would call stellar, but the illustrations are charming, the theme is perfect for the spooky season, and the story instinctively lends itself to fun actions that are repeated and built upon with every turn of the page. Pretty cute, all in all, and we don’t tire of it. My three-year-old has it memorized and still requests it over and over at bedtime. It’s a great selection for the under-7 age group. I’d like to check out this one, as the illustrations look fantastic and the story sounds clever. Anybody familiar? 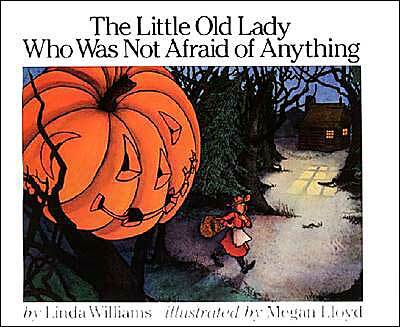 We haven't read ghosts in the house, but love The Little Old Lady. There is another book called Halloween Pie (I think) that my 5 and 3 year old love, and they think Hansel and Gretel is very scary also. I love the Little Old Lady. Haven't read Ghosts in the House but it looks scary! Thanks for this post I am going to go buy some halloween books tomorrow. I am so excited! Room on the Broom is also cute for the under 5 crowd. The good thing about the Little Old Lady book is it can become an active book with the clomping and the clapping, etc. They read this book in my boys' music class and had the kids do all the things rather than say any of the words when they got to each one. The kids really seemed to enjoy that. If I were throwing a halloween party for little ones, I'd definitely make this part of the program, read out loud in costume while kids fill in all the actions and sounds.